You don't need a dining table or a cluster of couches to have a conversation, but they help. This interplay between life and stuff is what makes interior design such a fascinating discipline. Rather than mimicking interior design trends this book provides both the inspiration and... read full description below. You don't need a dining table or a cluster of couches to have a conversation, but they help. This interplay between life and stuff is what makes interior design such a fascinating discipline. 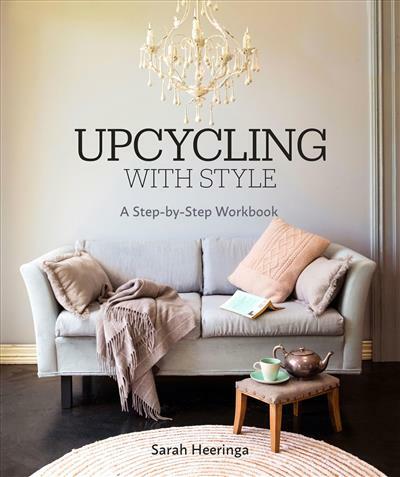 Rather than mimicking interior design trends this book provides both the inspiration and practical information to upcycle tired objects and give them a new lease of life. Give an old couch a revamp, make quirky cushions, embark on a quick kitchen makeover, or revitalise a tired garden corner...Upcycling with Style is full of ideas and tips for how to be creative and give your home a shot of style. Upcycling with Style encourages readers to think creatively. It is packed with projects, tips and practical information as a guide to making your home and garden inviting places without having to splurge on expensive items. Comprehensive step-by-step photographs help as a guide to clever project ideas that will help to create stylish and unique living spaces. Sarah Heeringa is a mother of four and an award-winning journalist and editor. As Editor and now Creative Director of Good magazine she is involved in conceiving, curating and art directing magazine shoots and she creates makeover projects for every issue. She is currently renovating her historic villa and is an enthusiastic upcycler, gardener and homemaker.